The Temple at Ayodhyapuram is under construction. The Mulnayak of this temple is First Jain Tirthnakara Shri Rishabdev Bhagavan. 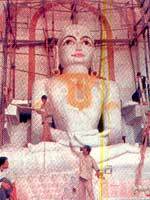 The statue is made so big in order to suit Shri Rishabdev Bhagavan's actual height according to our sacred books. It is believed to be the biggest all over the world. Its height is 23 Feet and weighs 350 tonnes. The statue is made of a single stone. 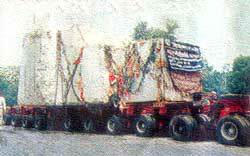 The huge stone was brought from Jaipur (Rajasthan) on specially made truck of 150 wheels with 2 high power engines. The cutting of stone and to place it on wheels it took 62 days. It took another 68 days of hard work to make it reach the final destination which is at a distance of 1000 kms. 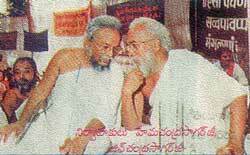 The temple is being constructed under the supervision of Shri Hemachandra Sagarji Maharaaj and Jinachandra Sagarji Maharaaj.